303 - 305 Commercial Road, Yarram. Although not the first brick building to be built in the town, the Federal Coffee Palace is the oldest remaining brick building in Yarram (Victoria, Australia). The actual construction date is uncertain, but some historical records show that it was built in 1888 by Charles Stockwell for James Buckley, whose initials are on the corner facade. The date of 1901, also on the facade, is not necessarily the date of construction as is generally thought, but the year of Federation of Australia. Quite a number of buildings were adorned with this year giving respect to the historic occasion. It is significant to note that the township of Yarram Yarram was gazetted on 8 December 1893. Having written this many years ago, based on early photographs and in particular John Adam’s book ‘From These Beginnings - History of the Shire of Alberton’, further information has come to light which contradicts these assumptions. The following article in the Gippsland Standard, dated 8 October 1901, clears up the construction dates and provides further insight into the objectives of the owner, James Buckley. Hardly seven months have lapsed since the owner of a building block at the corner of Commercial and James Streets, know as Sale yard Corner, came to the conclusion that there was room for another business pile in the steadily progressive town of Yarram. And it is in practical and striking evidence at the close of September that a handsome brick structure has been completed by the contractors, and now only awaits an eligible and enterprising tenant open the new premises for transaction of business. ornament to the South end of Yarram, with Mrs. Dukes two storey hotel immediately opposite. After deciding to erect a large brick store on the corner allotment, Mr. Buckley had plans prepared by Messrs Inskip and Butler, of Collins Street, Melbourne, and tenders called for a single storey only, returnable 21 st March. But the value of land was rising to such an extent that the old style of going at so much per allotment was being rapidly superseded by the per foot conditions, and Mr. Buckley very soon recognised the wisdom of altering and extending the plans and specifications from a ground floor building, with 32 feet frontage to Commercial Street and 76 feet to James Street, to the more costly, and yet prospectively or proportionately more economical plan providing for a second storey and eight additional rooms. To be brief, however, and to the point, a tender for the erection of a two storied building at Sale Yard Corner was accepted by Mr. Buckley - the fortunate contractors to whom the work was entrusted being Mr. John Casbolt and Mr. Jas. Graham, both of whom are old residents of the Shire, and practical men of extended experience, the one as a carpenter and builder, the other (Messrs John Casbolt and Sons) as bricklayers, plasterers etc. With a frontage of 32 feet to Commercial Street and 76 feet eastward along James Street, with an elevation of 24 feet from footpath to parapet, there is floor space at command for front store 30 by 20~ and three 9 by 11foot rooms on the ground floor, all of which have 13 foot walls~ whilst on the upper storey there eight good rooms, ranging from 12 by 14 to 16 by 14 feet, all of these having 11 foot walls. There apartments have had two coats of plaster, and are reached by a substantial staircase, in fact the style and appearance of the rooms, both upstairs and down, suggest the possibility of opening it at some future time as a first class coffee palace, but trade and commerce is the fiat at present, and early intimation of an opening tenant is anticipated. The requisite number of fire places, fixing of sky lights in the roof, stone sills to the front doors, iron joist for carrying window openings, improved method of ventilation~ all these are suggestive of warmth, light, strength and durability~ whilst the three coat work of our local painter, Mr. Ed. Newberry, and plumbing operations of Mr. Frank Mattern, have combined to place Mr. Buckley's commodious and substantial corner block before the public as an ornament to the town, an example of spirit and enterprise, and a credit to every workman engaged therein; not forgetting Mr. John Corcoran, who acted for the owner as inspector of works during progress of the contract. 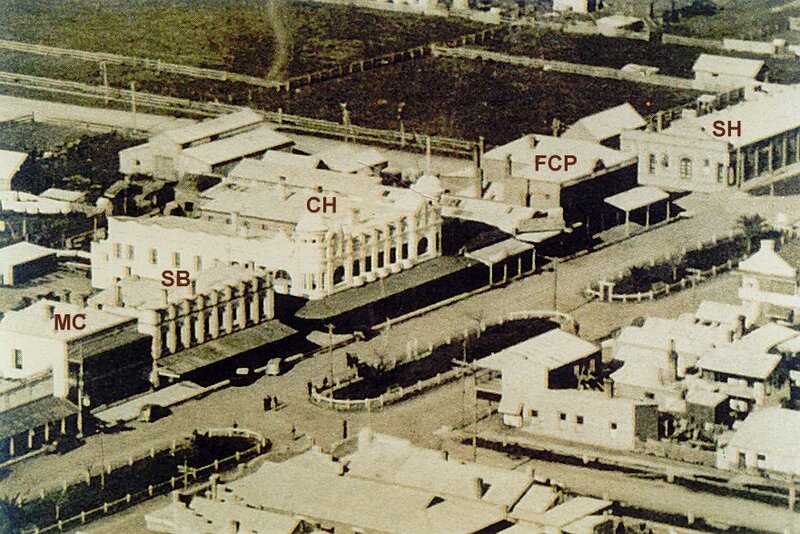 The FCP building was constructed on land made available at a major land auction on 18 November 18, 1885. 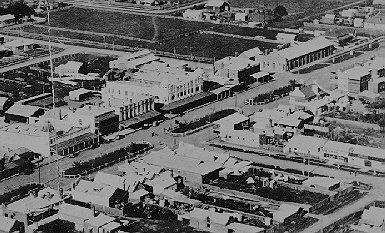 The land, facing Commercial Street (as it was called then) between James Street and Devon Street, was part of Yarram Park, the vast estate of the Nicol family. Blocks were auctioned by Mr. A. Gellion. The initial building, on the corner of James Street and Commercial Street, consisted of a thirty-foot frontage along the main road. This first building can be easily identified as it did not include the section with the arches. (Note the photographs). This photo looking north along what was then Commercial Street, now Commercial Road, was apparently taken sometime between 1900 and 1905/6. Note the Federal Coffee Palace on the right: there are only two windows on the front first floor. This was the first half of the building, built in 1900. 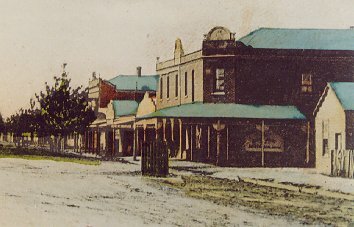 The Yarram Hotel is on the left, now the site of the current DCNR building (or whatever they choose to call themselves this year!!). It is interesting to note from the Gippsland Standard article of 1901 that it appears Buckley’s initial objective was not to construct a building of hospitality, ie a hotel or coffee palace, but as business premises. In fact, James Buckley's objective was indeed to run a hotel. 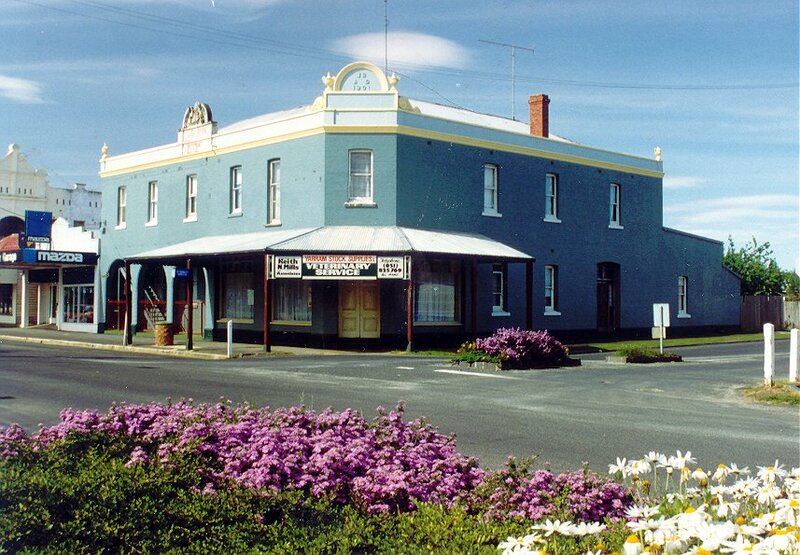 However, the Yarram Hotel, opposite in Commercial Street (on the land where the DCNR building now stands), was granted a renewal of its license and Buckley’s new building was opened as a boarding house and adopted the name Federal Coffee Palace. Such a name was not unusual. Each major town had a 'coffee palace' which appears to have very little to do with coffee, nor were many regarded with any likeness to a 'palace', but they did indicate a teetotal establishment which catered for travellers. Melbourne had its famous Federal Coffee Palace, later Federal Hotel I believe, pulled down for 'development' sometime in the fifties. 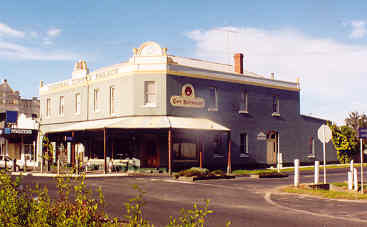 It is stated in the historical records prepared by John Adams' In These Beginnings, published by Alberton Shire Council.1990, that: E. (Edmund) Buckley opened the Federal Coffee Palace in 1888 on the James Street Corner; and that on 19 October 1887, Charles John Stockwell opened a new accommodation house in Yarram, the Yarram Coffee Palace with nine bedrooms, Yarram’s first brick building. Stockwell was a stonemason and, when he was unable to find a good brickyard, he turned to some good clay in James Street near where he planned to build an make his own bricks for the building. The Yarram Evening Club, with fifty members, was established in late 1892 with members paying for their own private bar and club room facilities. This was in Stockwell's Coffee Palace. Stockwell went on to build the Yarram Club Hotel next to his (Yarram) Coffee Palace in 1893. (This would have been the old Club Hotel, not the current building. There also appears to be some contradiction here with Edmund Buckley opening the Federal Coffee Palace ‘in 1888 on the James Street Corner’. If this was the case, it may have been in a previous building on the site.) Stockwell gained a licence for his (Yarram) Coffee Palace in 1902 when William Dwyer took it up placing it in the name of Mrs. Eliza O’Callaghan and then, after her death, of Mrs. John Barry. The Yarram Club itself, with Jack Stockwell as secretary, moved to James Buckley’s buildings on the corner of James Street and Commercial Street (Road) in 1906.
north from James Street, from the same position as the above photograph. Note that the Federal Coffee Palace on the right is larger and has five windows along the front. The photo is undated, but possibly 1920s. It is noted by Adam's that James Buckley had 'planned a large two storey building for the Club at this time boasting a frontage with arches and cemented pillars and a generous balcony linked with his Federal Coffee Palace'. This gives us the first indication that the Federal Coffee Palace building, as it now stands, in fact two buildings - the first built in 1900/1901 with just the two windows on the Commercial Street side as shown in the above photograph, and the second construction added to the first in 1905/06, as shown in the photograph below. In 1905 or 1906 (the date has only been established from photographs), James Buckley built the second section of the building characterised by its three arches, facing Commercial Road. John Adams, in From These Beginnings, states, "James Buckley ... had planned a large two-storey building ... boasting a frontage with arches and cemented pillars and a generous balcony linked with his Federal Coffee Palace". Unfortunately, Buckley never went through with the balcony, but he did 'join' the two buildings together upstairs. If you look closely at the front of the building above the arches you can see the original bolts that Buckley had planned to hold his balcony. Men's clubs were the major venue for entertainment in those days, and the Yarram Club, with Jack Stockwell as secretary, moved from its original venue at Stockwell's (Yarram) Coffee Palace , to "Buckley's buildings on the corner of James Street in 1906". (This assists the dating of the building). Perhaps it should be mentioned at this stage that the Stockwells and the Buckleys were owners of large tracts of land and buildings in town. On 19 October 1887, Charles John Stockwell opened a new accommodation house in town, the Yarram Coffee Palace with nine bedrooms, Yarram's first brick building. Stockwell was a stonemason and, when he was unable to find a good brickyard, he turned to some good clay in James Street near where he made his own bricks for the building. (The Yarram Coffee Palace has frequently been confused with the Federal Coffee Palace, aided not inconsiderably by the fact that the Federal Coffee Palace was for a time, later, called Yarram House, and signwrit accordingly). 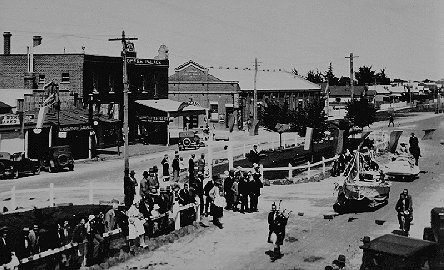 Back to Yarram Parade in 1932: Federal Coffee Palace on the left centre, and the Strand Theatre at centre, on the corner of James and Commercial Streets. 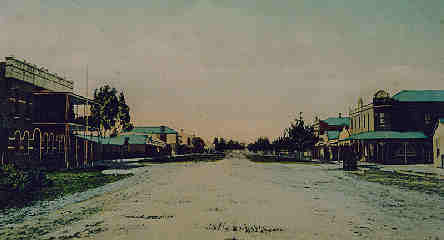 Aerial view of Commercial Street (Road), the main thoroughfare through the township of Yarram. See close-up below. Edmund Buckley was a neighbour to Henry Bodman at Trenton Valley, and grazed a total of 23,020 acres and in common with other squatters, held runs over a large area. Kenneth Cox writes in Land of the Pelican, "He represented a class who were bold and adventurous, gamblers unafraid iof risks, who held dominion over large tracks of country during times of drought and prosperity. In one season they scarcely knew the extent of their wealth, followed by years of struggle and depression during which they were kept afloat by money-lenders and creditors." His father Edmund Buckley (Snr) was thrown from a horse in 1859 and killed, whilst returning from the second Agricultural Show at Tarraville. James Buckley died in St Kilda in December 1923, and was buried in Brighton Cemetery. Yarram's Federal Coffee Palace was run by Edmund Buckley, James Buckley's father, and it is sometimes thought that he was the builder and owner of the property. This may well have been so, however legal deed documents available document the first entry on 24 November 1899 with James Buckley as being the owner. James became a leading citizen in the town and a councillor. It is generally thought that the building was built by Charles Stockwell for Buckley.but the Gippsland Standard of 8 October 1901 contradicts this. In its one hundred years, the Federal Coffee Palace has seen a number of owners, but throughout, even to this day, it has provided 'permanent' rooms for boarders. It is a credit to Stockwell and the builders of the time that the building is still in an extremely sound condition. Stockwell probably obtained the bricks for the Federal Coffee Palace from the same clay quarry in James Street where he obtained bricks for his 'coffee palace'. It should be noted that the Federal Coffee Palace is triple-brick for the first storey, and then double brick for the upper floor. It is thought that the bricks came from this same clay quarry in James Street. As there was no need for a public bar area, which presumably was to be located right on the corner of the building (on James and Commercial Streets), this prime site became a shop. A history of the tenants of the corner shop is somewhat difficult to determine. It is documented that Ernest L. Grano had come to Yarram in 1904. His brother Fred Grano opened a tobacconist and fancy goods shop in 1909 while his wife opened a cafe the previous year. This photograph generally reputed to be taken in 1902 of "the police band marching down James Street towards the Commercial Road corner", shows very clearly that E.L. Grano was a grocer and ironmonger in the Federal Coffee Palace corner shop. Records also show J.S. Wood as proprietor of the Federal Coffee Palace. The Grano shop lasted well into the 1930s, perhaps longer. The corner 'shop' was at one stage home for a seamstress business, and in later years was used as the resident for the proprietors of the Federal Coffee Palace. For some ten years, until May 1997, the premises were tenanted by Keith Mills, veterinary surgeon. Pride of the early owners was the large billiard room directly behind the aches fronting Commercial Road. To this day the 19ft x 27 ft room still retains its original narrow-pitch corrugated metal ceiling and timber dado walls. The single billiard table was mounted, not directly on the baltic floor, but securely on eight concrete stumps flush with the floor. These may still be seen in this excellent room. It is not known when the last game of billiards was played in the room, and what use was subsequent made of the room - and whatever happened to the billiard table? Adams records that “In February 1933 the old billiard rooms at the Yarram Coffee Palace were opened as rest rooms by Cr. A.C. Davis.” There is also a records that was used later as “Rest rooms of the Country Womens Association”. I believe Adams has confused the Yarram Coffee Palace with the Federal CoffeePalace. Some time after 1974 the owners of the building partitioned the large room into two sections and used this as part of their residence, in conjunction with the self-contained flat behind the room. 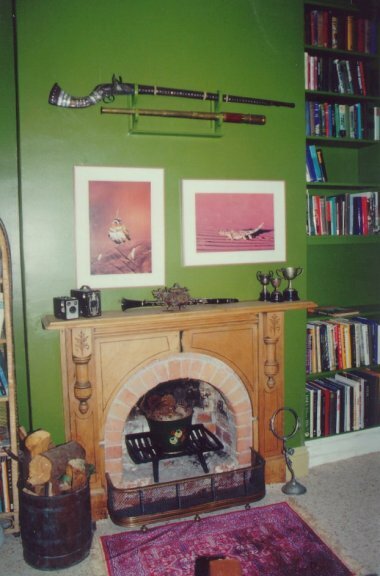 The partitions have now been removed and the old billiard room was used a book depository for Oceans Enterprises, publishers and distributors, for many years from 1991. In 2008 it became a music room, delightfully restored by piano teacher Lisa Blackman, and used to this date (2011). Vehicle's outside Mason's garage next to the Federal Coffee Palace building, then named Yarram Hiouse. No date, but probbly in the 193os judging by the vehicles. Ownership of the building, and proprietorship of the Federal Coffee Palace as a boarding house, changed hands several times. It is recorded on the Deed of ownership that Lily Elizabeth Buckley and Josephine Monica Buckley, spinsters, assumed ownership on 27 July 1910. Their relationship to James Buckley is not recorded - possibly sisters, or maybe daughters. On 20 September 1916, an advertisment in the Yarram Standard stated : "Mrs Weir has pleasure in announcing that she has leased the Federal Coffee Palace and hopes to receive the liberal support accorded her predecessor." Looking south-east across Commercial Road (previously Commercial Street), with the James Street intersection on the upper far right. The buildings are: MC - Men's Club. SB - Stockwell's Building. CH - Club Hotel. FCP - Federal Coffee Palace. SH - Strand Hall/Theatre. All buildings remain except for the Strand Theatre which is now a service station. And the ornate verandah of the Men's Club has been unsympathetically removed. Photo 1930s. Lily survived Josephine and the deed was placed in her name on 20 June 1946, together with Angela Merie Chenhall, 'married woman'. It is believed the Chenhall's ran the boarding house up to the time when the McConville's took over. Mavis June McConville, 'married woman', was noted on the deed as of 21 January 1957. The deed also indicated that Mrs. McConville had her property mortgaged to Frederick George Jeffs, and then to Frederick Charles Orchard on 23 March 1961, discharged 13 April 1967. On 13 April 1967, Henry Claremont Pyke and Mary Ada Pyke were recorded as ‘Yarram Boarding House Proprietors'. The McConvilles and the Pykes are remembered to this day as having run an excellent boarding house during the peak development of Yarram. Their rooms were generally full, particularly in the fifties and sixties when Yarram was undergoing positive growth. Many of the rooms were taken by couples, the men working on the railways, the timber industry, building, and on the land. There are many interesting stories to tell of these years, but this is not the place for such scandal. However - its is known that a death occured when a man fell down the stairs after an altercation, a lady made profitable use of her time in one of the rooms, and a prominent Melbourne barister spent his last days in excile here after a legal scandal..
On 2 January 1974 Frank Wanka, 'shoe repairer' and Maria Elfreda Wanka, 'married woman', became Joint Proprietors. Elfreda ran the boarding house with Frank establishing a honey business, the bees in the back yard perhaps not totally appreciated by the townsfolk. By now the concept of the boarding house as a major means of accommodation was dwindling, and the number of residents diminished accordingly. 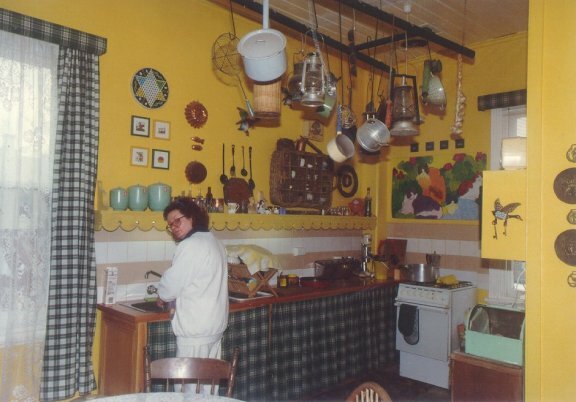 The 'Honey House' when purchased by Peter Stone and Wendy bouker in November 1990. The major tenant on the corner was Keith Mills, veterinry clinic. The owners residence at the time was in the single-storey section shown at the right of the building, on James Street. The first floor was the 'boarders area', for short and long-term residents. Peter and Wendy occupid the majority of the top floor from 1991 till 1999. It is now offices for Oceans Entrprises, publishers and distributors. Long trm residents live in the north wing on the upper floor (above the arches). There is now the Federal Coffee Palace Restaurant on the corner. The 'Hony For Sale' sign was soon removed and the building painted. By the time writer and publisher Peter Stone bought the building on 27 November 1990 the whole top floor, with some thirteen bedrooms, was devoted to only three boarders. Peter Stone and wife Wendy Bouker initially resided in one of the groundfloor units before moving upstairs and commencing wholesale renovations. Boarders, as such, are no longer taken in. A separate self contained wing along Commercial Road with four bedrooms, was initially used for boarders but is now for long term residents who share facilities. One vert content tenant has remained, in the same room, for over thirty years. It is interesting to note some specific features of the building - or should we say, buildings. Remember that the construction consists of two buildings built at separate times. This can clearly be seen, both in its design, and construction. Initially, when the first building (on the corner) was constructed, Stockwell probably realised that there would be another separately-owned building built next door abutted to his, so internal bedrooms were fitted with skylights but no windows. The original skylights are still there but windows were installed probably at the time of construction of the second building in circa 1906. These 'renovations' can be clearly recognised and were pointed out by an historic-building expert from Canberra. From a design point of view, it seems strange to some that on entering the front door from Commercial Road, under the arches, one enters a short corridor - which leads out to the back yard. Only one other door leads off the corridor - into the old billiard room. This corridor also contains a large window from the first building, an opening that was clearly built as an external window. This window is now covered. It is not possible to go from the groundfloor of the first building to the 'billiard room' in the second building without first going outside. (A covered walkway now provides weather protection). All this seems to be poor design until the history of the building and its construction is realised. James Street main residence entrance after renovations. Upstairs, the 'joining' of the two buildings is not as obvious but on close inspection, it can be seen that an entry was simply made in the outside wall of the first building to form a corridor into the second building, this completely linking the two buildings. This has resulted in two corridors that are at right angles to each other, paralleling James Street and Commercial Road. The 'join' is noticeable if you look closely at the skirting boards. The two separate wings of the building have provided the opportunity to isolate, for privacy and sound, the main residence from the self contained unit that houses the permanernt residents. It should be remembered that when the buildings were constructed, no electric light nor plumbing was available. Gas was however fitted for lights and in one room only, the remnants of the gas fitting, a small pipe extending from the ceiling, is still to be seen. Electric power was later installed, around the 1920s probably, and rather unsympathetically at that. The original cloth and rubber-covered electric wires were housed in metal conduit and fixed to the internal walls from a network in the roof. Some of these conduits were 'disguised' in wooden formwork. The building has now been completely rewired. The original upstairs area of thirteen bedrooms was once on only one electric circuit. This may have been fine for just electric light, but as more and more electric appliances came on the market, especially electric heaters, it became totally inadequate. Now the upstairs area is on four circuits. The original plumbing was to todays standards quite a disgrace. In order to provide two toilets on the upper level (male and female), it was decided to bring in the pipes from outside the existing rear wall of the second building (the Commercial Road wing). One toilet however had to be accessed from a bathroom in the first building (the James Street wing) that had no external wall and abutted the second building. The solution was to knock a hole through two sections of double brick - the 'joining wall' of the two buildings. This was most unsympathetically done and the resulting bathrooms were like a rabbit warren. This has all been remodelled with new toilets and bathrooms constructed in a much more sympathetic manner. Indeed, the bathroom of the main residence is now one of the main features of the building, with a dado wall made from the baltic pine from the original partictions. The original cast-iron bath, since recoated, remains in the new bathroom. Some major remodelling to the ground floor rooms was done to the building sometime around the 1920s, the date being determined from the materials used. There is a large self contained flat that borders James Street, with a 12ft high ceiling. The flat had an entrance into the main downstairs area of the original building, but is now boarded up by the present owners to isolate the area into a self-contained flat. It is understood that the large living room in this unit was once the main dining room of the boarding house.The original floors and ceilings are all of baltic pine. Lathe and plaster is the main medium for internal wall construction, and this continued up until the 1920s. The requirements of a boarding house are of course different to the needs of an hotel and the downstairs area was extensively remodelled. The original floor plans are not available, and it is difficult to determine where the original internal walls were. The main entrance to the proposed hotel was, presumably, from the corner of James and Commercial Streets. This would probably have been for the public bar area, with the main residential entrance in James Street. This later entrance would have opened into a large foyer. Until recently, the entrance area was partitioned into bedrooms. Thid was demolished in 1994 to provide a large and attractive entrance to the main residential area from James Street. It now forms on entrance to the book business Oceans Enterprises. The external areas include the large 'stables' of some 30ft x 40ft, now concreted throughout, with an external entrance from the lane behind the block, and from within the back area. This is an ideal garage and workshop/storage area for which it is currently being used. The extrernal entrance to the lane is boarded up. This was actually the entrance for the stage coach which would come in from the laneway. 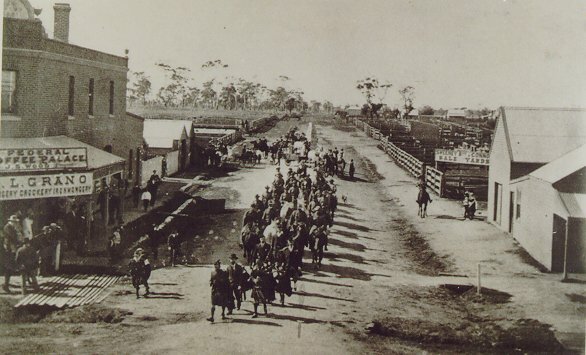 (The stage travelled from Sale and on to Leongatha, with the overnight at Yarram). There is also another storage shed, and a covered garden-tools area. Interestingly, when the current owners were working in the unloved backyard, they found teeth and bones. Somewhat alarmed, they were soon to realise that the bones were those of a horse,but the teeth were human. It turns out that a dentist, Bill Ottie, had once plied his trade from the small shed (which is lined) and disposed of his surplus teeth by simply throwing them out the window. The backyard is now covered with Besser pavers. A second area is grassed and paved, with a clothesline and fruit trees. One of the flats has a small private garden/entrance off James Street. There is also a huge well, some thirty-feet deep and at least fifteen feet in diameter, narrowing to a 'neck' of three feet. This is permantly filled with water at the natural level of the water table. It was used for rubbish until the 1960s, but now has a heavy concrete cover. Incidentally, the concrete 100-Mile post to Melbourne is down this well. But that is another story. Prior to Federation, it was not an uncommon practice to place a coat of arms on a prominent commercial or government building, as an expression of pride. However, there was no official design for a coat of arms till 1908 when King Edward VII made, by Royal Warrant, the first official grant of a coat of arms to the Commonwealth of Australia. Prior to this any design could have been created and used. The 'coat of arms' shown here on th Federal Coffee Palace building consists of a shield of quadrants showing a ship, anchor, a sheep a and a sheaf of wheat. The Federal Coffee Palace was in a sad and sorry state when taken over by the Stone-Boukers in Novenmber 1990. 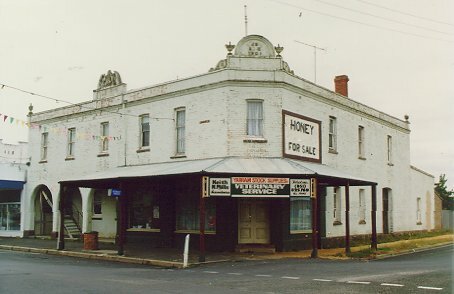 A large hand-painted 'Honey For Sale' sign greeting visitors to Yarram coming in from the south, giving rise to the building been known for these latter years as 'the honey house'. The building had not seen a coat of paint for many decades. Indeed, whoever painted the bulding in the first place should hang his head in shame, as the original brickwork was tuck-pointed. It was probably first painted in the late thirties/forties. A complete facelift has given new life to the building, with a coat of sadly needed paint, and the 'restoration' of the original name FEDERAL COFFEE PALACE along the Commercial Road fascade. (The name was also along the James Street side but this has not been redone). An exciting time was had with the painting of the original coat-of-arms on the building. This is in the tradition of the times, with the shield bearing a ram's head, sheaf of wheat, anchor, and sailing ship. The shield is guarded by a kangaroo and an emu. An attempt to determine the original colours failed as the official coat of arms for Australia was only established in 1906. 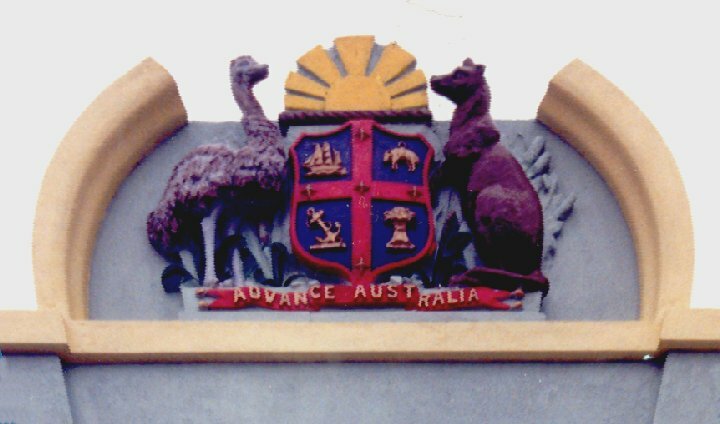 The Stone-Boukers however copied the colours of an identical coat-of-arms on the old market building in Adelaide. 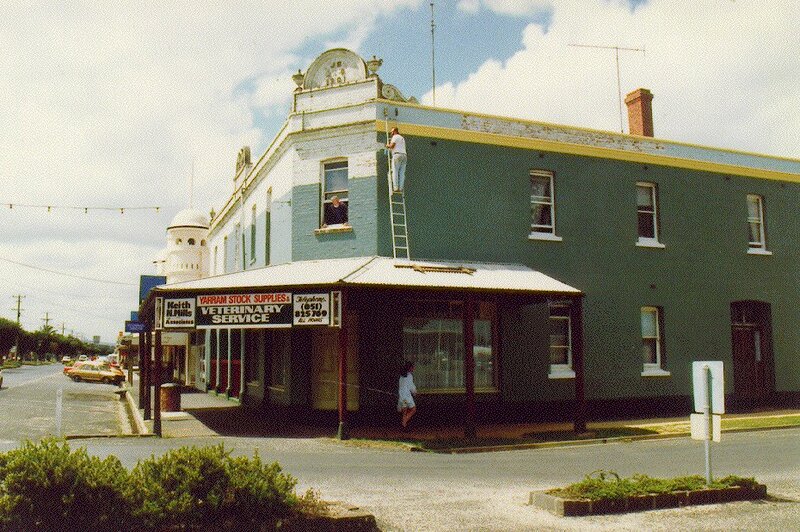 The Federal Coffee Palace building, after a fresh coat of paint, in 1994. The name has not been fitted to the top parapet of the building and the crest has not been paintd. The paint job was completely done by the new owner, Peter Stone. To improve the property, as they lived in the building after their purchase in 1990, Peter Stone and Wendy Bouker extensivly renovated the property: gates and fences were installed, the back yard paved, the roof replaced (in part) and the remainder attended to, the stables waterproofed, electricals replaced, a complete new plumbing system installed from the meter, two new hot-water appliances installed, a huge slow-combustion heater installed, a new staircase built at the front of the building (giving private access to boarders), walls demolished where required to expand the small original bedrooms into serviceable living areas, two new kitchens installed, two bathrooms installed, a new residence foyer constructed and the building completely repainted. The prime concern of the Stone-Boukers was to ensure that the self-contained flats were in first class condition before concentrating on their own living area. Nobody said it was going to be easy.! Most of th building could be reached with scaffold but the section above the verandah was awkward to say the least. There is no room here for a fear of heights. Whilst Peter was up the ladder, he heard a car horn honking. Friends often did this as they pssed and would be acknowledge, if possible. On this occasion, the honking persited. Very carefully, Peter turned around and saw a car stopped in the middle of James Street, holding up traffic. The elderly lady driver stuck her head out the window and yelled out, "I don't like ya colour".. The ungracious yet understanable reply was, "Well, you do it and you can choose whatever colour your want". Whilst the Stone-Boukers were in residence, the Federal Coffee Palace was configured as follows: a large private residence with private entry from James Street into a large foyer and stairwell, leading upstairs to an open dining room, kitchen, and a corridor for entry to two bedrooms, huge 15ft x 15ft bathroom, a library and a very large 30ft lounge. 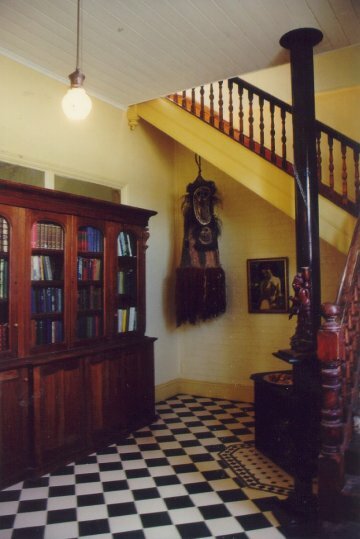 Downstairs, off the foyer, were two more bedrooms, one used as a private study. The 'boarders area' (as it was called - the permenent residents unit) is accessed from the front stairwell (just behind the arches) and enters into a long corridor in the Commercial Road wing, giving entry to four small bedrooms, a bathroom and a lounge-kitchen area. This area is completely self-contained from the main residence. Pweter Stone initially used the residential unit behind the billiard room as his Oceans Enterprises office; the office was later moved to the residential area upstiars, and the unit reverted to a two-bedroom flat. There is also a sing;e-bedroom flat on the ground floor fronting James Street. After renovations: the library in the main residence with its open foreplace was a favourite place to relax. The opposite wall wall fully lined with shelves holding over a thousand books. The kitchen was renovated in traditional 'farmshouse' style, and also has an open fireplace on an exposed-brick wall. A dishwasher was later fitted, breaking the farmhouse rules! In August 1999 Peter Stone and Wendy Bouker moved to a country property ten minutes from Yarram to raise their son born that year. They retain ownership of the building, renting out three residential units, the Federal Coffee Palace Restaurant, and the music room. Peter retains the upstairs James Street wing as his office for Oceans Enterprises, a publishing and book distribution business. There is always work to be done on the buiklding. All other areas have been remodelled and repainted and simply require reqular normal maintenance. The beauty of all this is that, nomatter how much effort is put itto the building, Yarram's Federal Coffee Palace will live for at least another hundred years. The building was painted in 1991 and now needs a repaint which will hopefully be done in 2011. When Keith Mills moved his veterinary clinic to new premises in May 1997, the downstirs corner section of the builing became vacnt. At the time, there was no indepenant restaurant in town - the only place to dine was in the pubs or the 'Men's club'. Likewise, there was no cofffee shop of note where a good capuccino could be had. Recognising the need, but not able to operate such a restaurant, Peter Stone and Wendy bouker approached a young couple in town with an offer to support their establishment of a cafe- wine bar.Sandra and Tristan Morton-Pedersen took on the massive renovations in July 1997, at the same time taking forml training in hospitaliy management and cuisine. Tas Haris was also a part owner of the restaurant businss, as was Peter Stone. By adding three additional rooms previously part of the main residence, the area was extensively renovated under thedesign of the Morton-Pedersens. The bar and other natural wood fittings were constructed by local cabinetmaker Colin Gibson of Welshpool, and further work undertaken by local builder Darren Young. . The Federal Coffee Palace Restaurant was opened 6 December 1997 by Federal MHR Peter McGauran. On opening it was, and remains, the only licensed restaurant and wine bar in Yarram. Peter McGauran, then federal Minister for Agriculture, remarked, “You can't help but be taken by the beautifully extravagant colour scheme and the eye to detail that has gone into the planning of the restaurant”. After Sandra and Tristan moved on, the Harris family operated the restaurant from May 2000 to December 2005. It was then taken over by Melissa and Chris Edwards who retained the original ambience of the restaurant, and added an imaginative and delighful menu. In September 2007, Jenny and Hans Gierens bought the business and now, Jenny and Anna Moore continue to develop the popular restarant as a comfortable meeting place in town for the locals and a welcome respite for travellers. And the coffee is great! See deails on the "Coat of Arms" featured on the building. If in hardcopy, this is a printout from the website http://yarrampa.customer.netspace.net.au. Prepared by Peter Stone. I am indebted to the late Di Nicol and Port Albert Museum archives for the use of historic photographs and research material. Also to Melva James and the Yarram Historical Association for the Gippsland Standard, dated 8 October 1901. Appreciation is also expressed to the many people who have stayed in, owned or managed the building during the past century.